Web video has exploded lately, becoming an important growth driver for many companies. To make videos that build brand awareness, generate traffic and influence purchase decisions, you’ll need to manage your time & resources, build a solid story, and record superb sound and clear HD video. The five common web video production mistakes and the tools to overcome them. From time to time we get so caught up in our story that we fail to detect contradictions along the way. The tiniest plot holes and ellipses will lose your audience. Run your storyline by others. Does it make sense to someone brand new to the concept? If it doesn't work on paper then it's not ready for production! Video marketing is here to stay, and many brands are focusing on it. It’s astonishing how many mistakes can be made throughout production due to inadequate tools and processes, causing delays and ballooning budgets. As with any piece of content, written or filmed, it's very important to target your audience and design for their taste and mindset. Also your audience is not going to find you if you don’t provide the correct phrases and keywords for your video to show up in search results. Want a tool to help you target your audience? I suggest Google Trends an awesome service which allows you to target your audience. This will show the interest that visitors have in specific items. It functions like the keyword research tool, the only major difference is that it exposes all the current trends for your brand’s target niche or market. See what your audience has been searching for on the web and the terms with the most hits. Managing time is one of the most difficult part of making videos, as there are many steps and contributors involved. If you feel like you are wasting time, a popular organizing method is the Pomodoro technique, it will help you keep track of where your time goes, but even better... it will make you a more productive video maker. We’ve selected a few solutions inspired by the Pomodoro technique. Marinara Timer is a free webapp that you can keep open in a pinned tab. You can select your timer alerts so you know when to take a break, or reconfigure the work times and break times to suit you. It's extraordinarily flexible, and you don't have to install anything. Tomighty is a free cross-platform desktop timer that you can fire and forget, following the traditional Pomodoro rules, or use to customize your own work and breaks. These are just a few good tools to choose from. Don't hesitate to experiment with others, but remember, the focus of the Pomodoro Technique is on the work, not the timer you use. Providing viewers with a clear, short and sweet call-to-action is a must for your final frame. Your audience can’t read your mind, so where do you think they’ll go after the video? To be sure you aren’t making this common mistake, try organizing your call-to-action in pre-production. Storyboard That developed a digital storytelling tool, they offer several different versions from a free plan best for light usage and premium plans for corporate and educational companies which allows multiple people to collaborate. Visualize the layout of key scenes in your web video and nail dialog! Video production can be tricky. And there are many issues that can arise when making a video, especially if it's your first. Producing a good web video is like writing a novel, it takes time. You will have a screenplay, hire a film crew, create storyboards, schedule a shoot, choose between music options,... Don’t forget to include your brand elements such as a logo, URL, social media tags and keep your videos in line with your brand. Stay clear of these production mistakes and you will complete a well thought-out effective video. 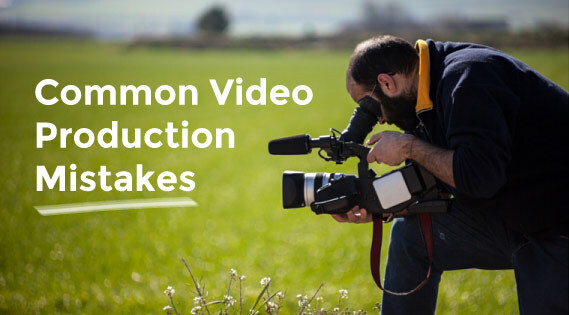 You now should be able to identify five common web video production mistakes and stay away from them before you begin producing your next video project.